Client consultation and a full internal technical review have prompted Vestdavit to refine lifting speed versus power options available across its entire davits range. The boat handling specialist has been focusing on how best to optimise equipment hoisting and lowering speeds within available power constraints, or reduce power while maintaining speeds. 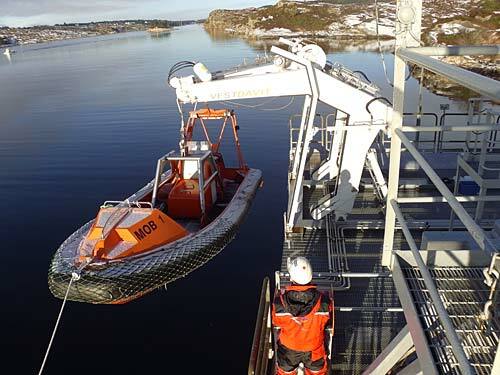 Where accumulators are used to store the hydraulic power used during davit lifting and lowering, increasing the hoisting speed may only be a matter of boosting accumulator specifications, Nordin explains. If the customer’s priority is to save power, the capacity of the HPU (hydraulic power unit) can simply be reduced for lower speed operations. Given the precise nature of the speed/power trade-off, Nordin says a generic solution is not appropriate. Vestdavit is trialling equipment at its own test facilities in Bergen and Poland to support the calculations covering available speed/power gains for both newbuildings and retrofit solutions, he says.